It is a combinational circuit which have many data inputs and single output depending on control or select inputs.​ For N input lines, log n (base2) selection lines, or we can say that for 2n input lines, n selection lines are required. Multiplexers are also known as “Data n selector, parallel to serial convertor, many to one circuit, universal logic circuit​”. Multiplexers are mainly used to increase amount of the data that can be sent over the network within certain amount of time and bandwidth. 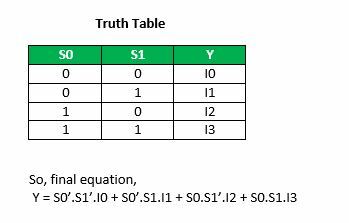 Now the implementation of 4:1 Multiplexer using truth table and gates. Multiplexer can act as universal combinational circuit. 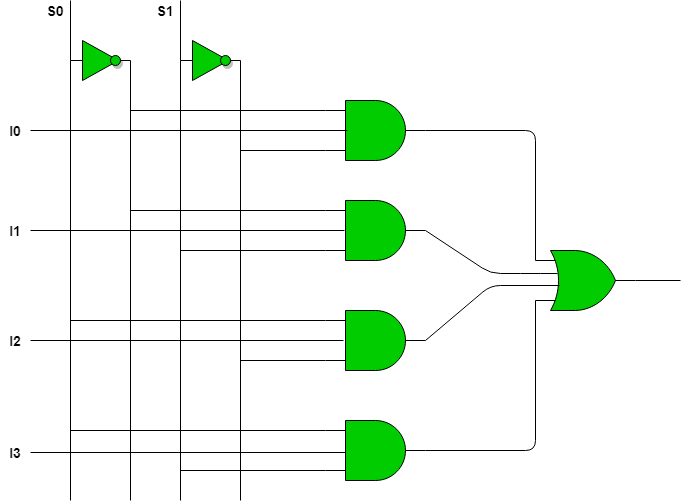 All the standard logic gates can be implemented with multiplexers. It is NOT Gate using 2:1 MUX. The implementation of NOT gate is done using “n” selection lines. It cannot be implemented using “n-1” selection lines. Only NOT gate cannot be implemented using “n-1” selection lines. This implementation is done using “n-1” selection lines. c) Implementation of OR gate using 2 : 1 Mux using “n-1” selection lines. 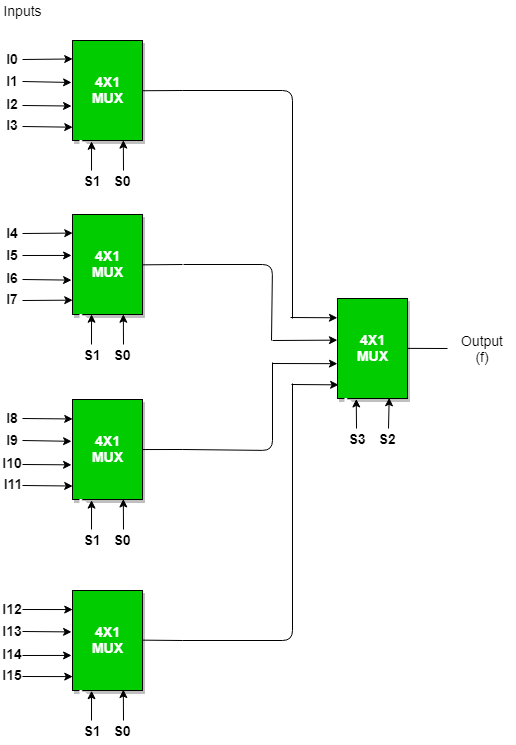 Implementation of NAND, NOR, XOR and XNOR gates requires two 2:1 Mux. 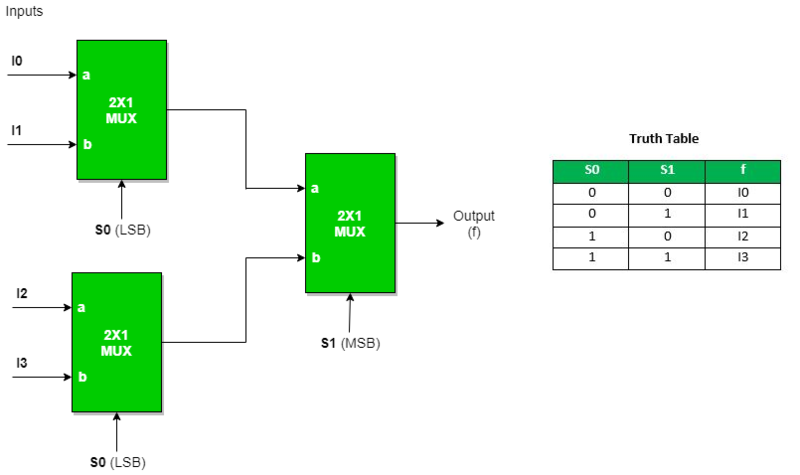 First multiplexer will act as NOT gate which will provide complemented input to the second multiplexer. 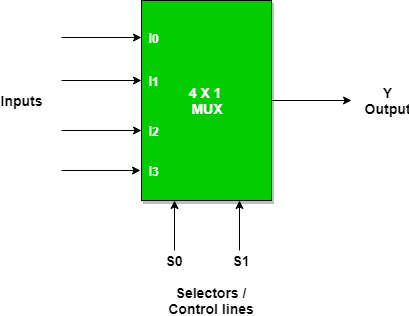 Three(3) ​2 : 1 MUX are required to implement 4 : 1 MUX. 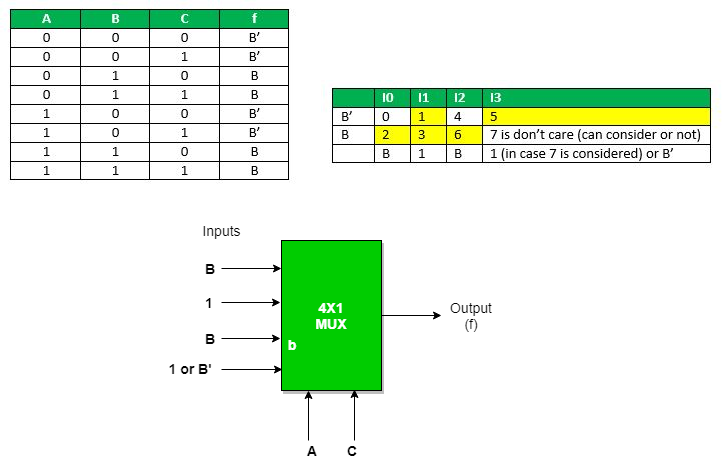 While 8 : 1 MUX require seven(7) ​2 : 1 MUX, 16 : 1 MUX require fifteen(15) ​2 :1 MUX, 64 : 1 MUX requires sixty three(63)​ 2 : 1 MUX. 2n : 1 MUX requires (2n- 1) 2 : 1 MUX. 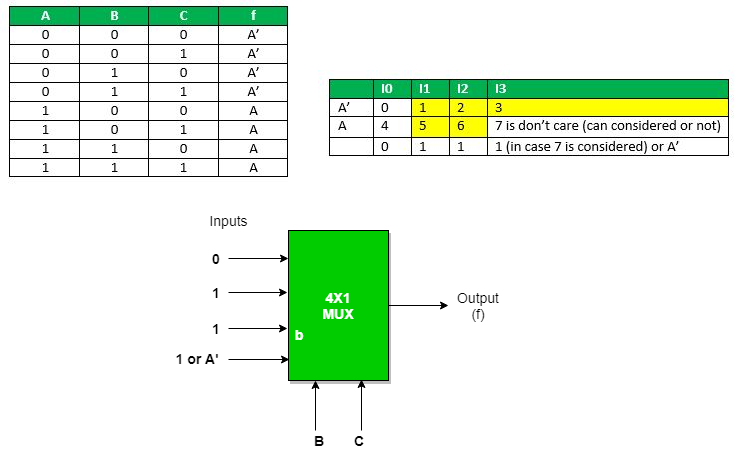 In general, to implement B : 1 MUX using A : 1 MUX , one formula is used to implement the same. KN-1 / A = KN = 1 (till we obtain 1 count of MUX). And then add all the numbers of MUXes = K1 + K2 + K3 + …. + KN. Using the above formula, we can obtain the same. 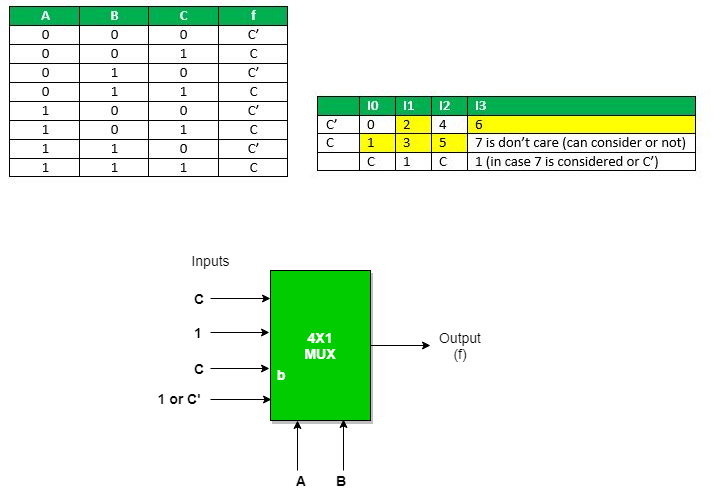 Hence, total number of 4 : 1 MUX are required to implement 64 : 1 MUX = 16 + 4 + 1 = 21. An example to implement a boolean function if minimal and don’t care terms are given using MUX​. a) AB as select : ​Expanding the minterms to its boolean form and will see its 0 or 1 value in Cth place so that they can be placed in that manner. b) AC as select : Expanding the minterms to its boolean form and will see its 0 or 1 value in Bth place so that they can be place in that manner. c) BC as select : ​Expanding the minterms to its boolean form and will see its 0 or 1 value in Ath place so that they can be place in that manner. This article is contributed by Sumouli Choudhury.